When performing Romantic and post-Romantic compositions it very often happens that a rise or fall of volume is specified in the score which demands that the right foot be occupied with the swell shoe (photo); sometimes also the composer may specify the rapid and sequential addition or subtraction of stops and couplers at the same time while both hands, thumbs, and left foot are occupied, which will require either a console assistant or, more commonly, use of the crescendo shoe by the right foot. If a phrase in the pedal ordinarily played by both feet (to keep connected the notes inside the slur) is written into such a passage, then the performer is faced with deciding whether to play that phrase using the right foot and temporarily ignore the dynamic indications -- OR -- to play the phrase entirely with the left foot so the right foot may remain planted on the swell shoe. Here the performer may have to arrive at a compromise which tries to preserve the best of both worlds, i.e. to provide dynamic nuance while at the same time keeping the pedal line intact without audible breaks. This will require a very flexible left ankle to negotiate the numerous substitutions of left toe for left heel on the same white key and leaps of 3rds, 4ths, and even 5ths the performer is likely to encounter in playing such phrases, as written. It may also require changing the manuscript mentally [See blog, Listening For The Listener] -- by either eliminating short rests written into the pedal line between adjacent notes in the score, thus connecting these notes ... or perhaps by inserting little breaks between awkward melodic intervals, at the ends of slurs, or even under slurs ... in order to get the notes in the left hand part more clear, or to free the left foot to move more smoothly and to free the right foot to remain on the swell or crescendo shoe, thus achieving greater control and making possible a more seamless crescendo or diminuendo. While flexible ankles are needful to an organist, we should never ever, repeat NEVER, practice or over-practice any exercise if it leads to pain or stiffness; everyone's ankles, just like their hands, have limits to what they can do, it's different for different individuals, and, once we begin to feel a little fatigue, we should never push beyond that. 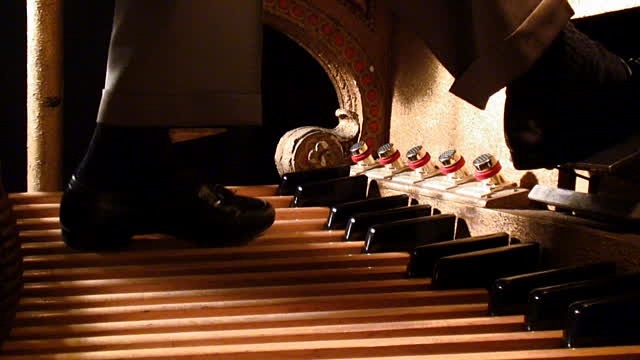 If however, through gradual methodical training, we should become adept at working our left foot this way, we will have done something that few organists have ever done -- we will have gotten beyond the mechanics of working the machine and have developed one of the most important faculties involved in reaching the hearts of our listeners. The way one develops this facility is by taking a composition that has these elements in it and experimenting with it, marking the heel and toe pedal indications in the score, practicing it that way, using our ear, and learning from the results; J. Stuart Archer's familiar arrangement of Londonderry Air is an example of a composition, among many others, which could be used for this purpose [See menu bar, Videos, Londonderry Air subpage]. For improving the general flexibility of the ankles there are many self-help books available [See blog, Exercises, Part II], and they're all good; the pedal exercises in the Nilson book were recommended by this author's teachers.